It’s November in Vegas. The Christmas decorations are already in stores. Restaurants are preparing their special Thanksgiving menus. And we’re all wearing maybe a light sweater because it’s the damn desert and we rarely get a break. So after you get off the plane and realize that that winter coat you brought with you is little more than a daily reminder of what you’ll be returning to next week, hit up one of our fantastic outdoor drinking spots and embrace the decent weather while you can. The alcohol may not actually make you warmer, but if you drink enough you won’t really care. Isn’t it magical? We keep waiting for fairies to fly out and give us cocktail cherries. Photo courtesy of Park on Fremont and Anthony Mair. This spot is just beautiful in every sense of the word. Everything about Park on Fremont is creative and clever, but we’re going to walk right past the meat dress and the machine gun antlers so we can get to the back patio. 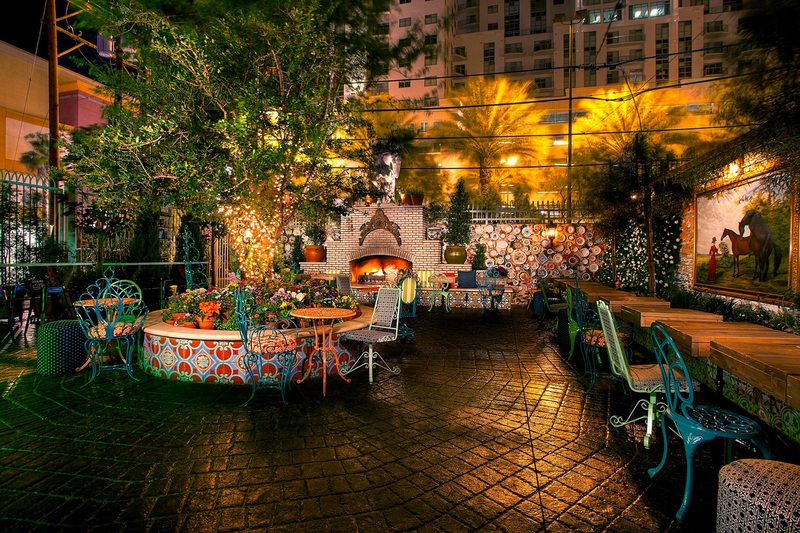 In the midst of Downtown, the back patio at Park on Fremont carves out it’s only little slice of whimsy with beautiful lights, a fireplace with a freaking angel on top of it, a tree (which is rare enough for Las Vegas) and a wagon on the roof. We don’t know how the wagon got on the roof, but if we had to guess we’d say drunk elves. And if you want a truly memorable experience, knock back a few drinks then find the hidden seesaw. It’s a wild ride. Don’t worry, the panoramic effect is from the camera. The space is nice but it doesn’t actually defy physics. Photo courtesy of Commonwealth and Anthony Mair. Continuing with the semi-singular promotion, Commonwealth is just down the street from Park on Fremont and is actually owned and created by the same people. Instead of the “Sure, why not?” mentality of its sister property, Commonwealth goes for a sophisticated hipster-with-a-day-job sort of vibe. To get outside you’ll want to head up the stairs. 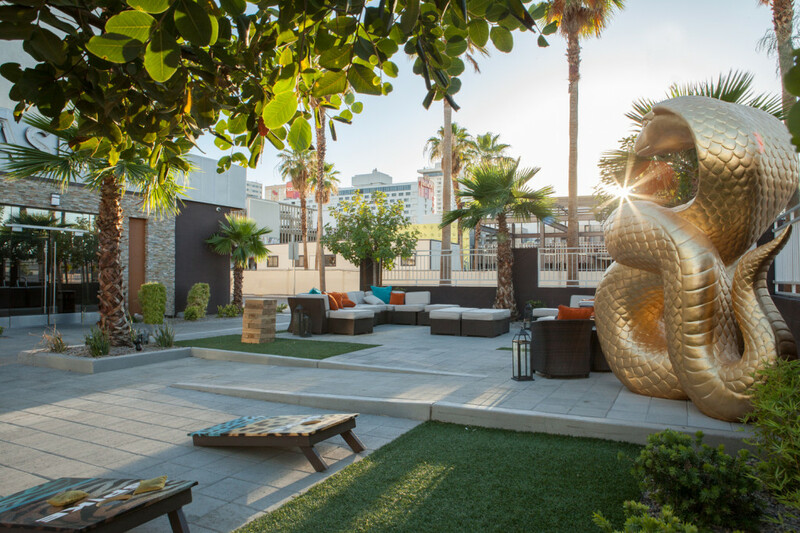 It’s not always open – it’s sometimes closed for special events – but the roof of Commonwealth is one of Las Vegas’ best bar treasures and a place locals love to keep to themselves. 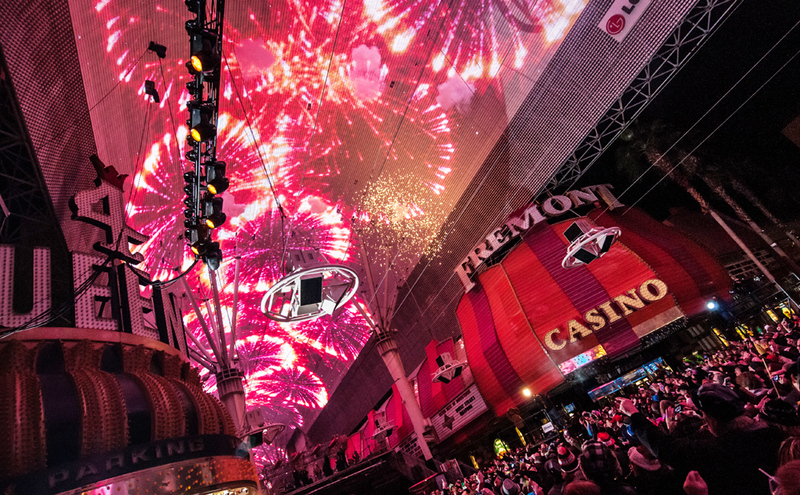 The view is a combination of buildings and the glory that is Fremont East. And the aura is cool and relaxing, even when the DJ is bumping. The space is close to everything, but sorry, not close enough to drink from the big glowing martini glass. Photo courtesy of Inspire Theater. Back down the street from Commonwealth and across from POF rests Inspire Theater, a beautiful space for art, dialog and a whole lot of cocktails. Combined in one building is the theater itself, a few bars, a café, and the Roof outdoor beer garden. Guess which one we’re gonna talk about right now. No, not the café. Are you not even paying attention to this post? The Roof at Inspire Theater has one of the best views downtown giving you sight of Fremont East as well as a line down the Fremont Street Experience. The space is a cocktail paradise that also has beer and live music. And the Inspire Theater offers a membership program that provides discounts, private access and much more. You don’t have to be a member to go, but when you are a member you get to act all cool and suave as you show off your perks. Yep. You can be drunk under that. Photo courtesy of Fremont Street Experience. We just mentioned this, and we feel the need to give it a bit more space. 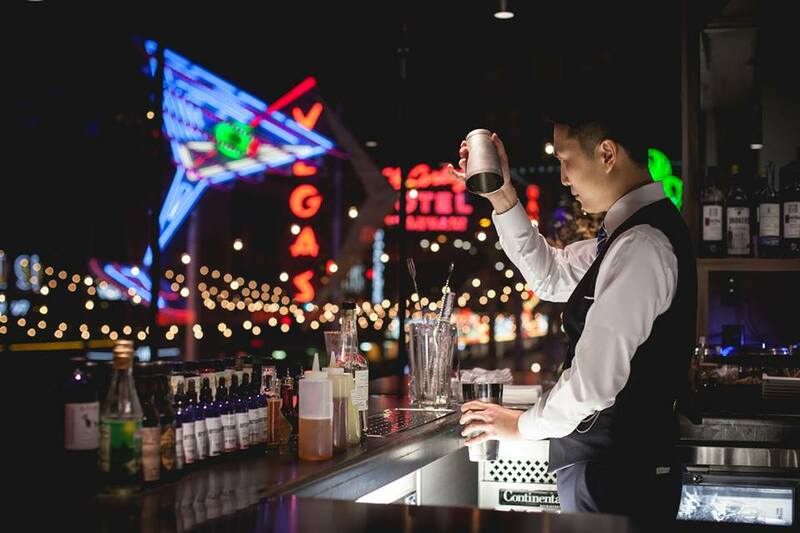 While the Fremont Street Experience isn’t actually a bar itself, it does have somewhere in the neighborhood of 37 billion places to get a drink – give or take. And since the entire space is enclosed under the canopy, with light shows at night, we figured it was safe to call it all one thing for the purposes of drinking outside. A few of the top drinking spots are Brass the Lounge, Banger Brewing and Hennessey’s Tavern. Some of those aren’t directly under the canopy, but it’s Fremont Street, it’s all one big party. If your idea of being outside is stretching your legs, and you don’t mind drinking out of plastic cups (it’s actually illegal to walk around with glass bottles or aluminum cans down there), then Fremont Street Experience is the place for you. And be sure to check out SlotZilla. Just go on it before you have a bunch of drinks. You don’t want to make a mess. We’ve gone six days without the snake statue coming to life and devouring any souls. Photo courtesy of Gold Spike. Staying downtown but moving a little north, Gold Spike is one of those locals’ favorites that is just all around fun. The inside has all sorts of games to play and a random bed in the middle of the room, but it’s outside that has our attention right now. Behind the bar is a beautiful outdoor space full of additions as quirky as those inside. There are places to sit and relax, games to play, a giant snake statue to ponder and space for some bitchin’ roller skating. The bar holds skating events back there where you can get your skate on while trying not to spill your drink or crush anyone when you fall for the fifth time because you haven’t actually skated since you were 12. Plus they have an Airstream and a tiny house and no, you can’t live in the tiny house. We asked. And if that policy ever changes we have dibs. Be sure to praise the mantis on the way in. It’s good luck and honor the god of no hangovers. Photo courtesy of Downtown Container Park. 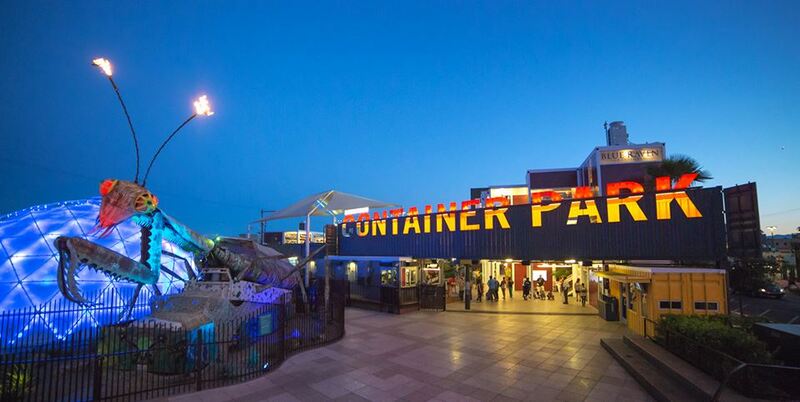 In another part of Downtown – it’s more diverse than you think – lies Downtown Container Park. By day it’s a family-friendly shopping-fueled playground guarded by a giant mantis that shoots flames. If that doesn’t get your kids excited then you should get them checked out because they aren’t having enough fun in life. But once 9 p.m. hits the kids get kicked out and the adults get to enjoy the space with a cocktail from great bars like Oak & Ivy and Bin 702. Ok, the kids don’t literally get kicked out, and probably decent parents go with them – the mantis cannot be trusted to watch the kids, it has other responsibilities. But people without kids, or people who hired their own mantis babysitters, get to enjoy live music and a fun experience surrounded by playground equipment. And isn’t that what having kids is all about? Ditching them to drink by a playground? Soon, slippery friend. Soon. Photo courtesy of The Cosmopolitan of Las Vegas. The ice rink isn’t going yet. We wanted to rip that Band-Aid off early. It’ll be open later this month. And when you can get up there and slip on some ice skates you can also indulge in some tasty cocktails and a truly unbeatable view. This is the spot to get that view of Vegas that you only see on postcards or on Instagram if you’re too young to know what a postcard is. 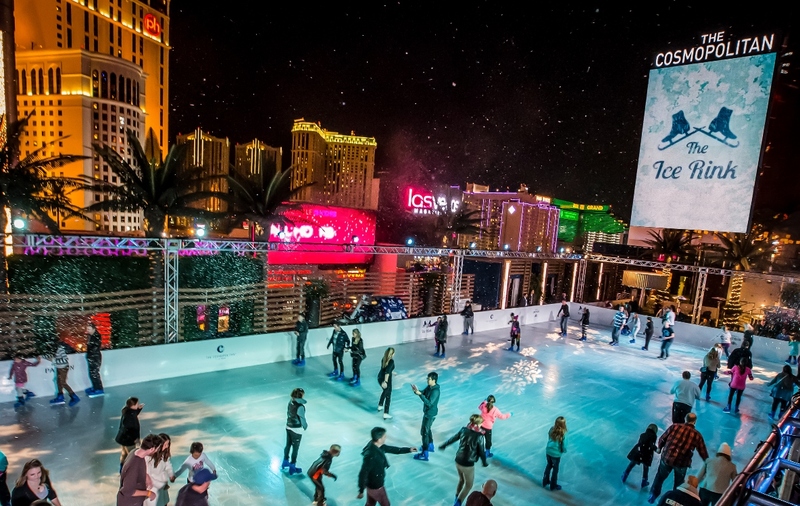 Aside from the ice rink itself, there are fire pits, plenty of seating and enough space for you and your friends to stand around debating whether or not you should skate because you might fall and embarrass yourself in front of that cutie by the bar. Fact: You should skate and you should fall then you should laugh and have fun because that makes you super cool. They’ll be all over you like flames on a marshmallow. Don’t jump over the water. It looks fun, and it is, but don’t do it. Photo courtesy of Vice Versa and Vdara. This is for the intimate bar-goers. When you want to relax and snuggle or just escape the congestion without feeling confined, Vice Versa has you covered in a warm and serene outdoor space. 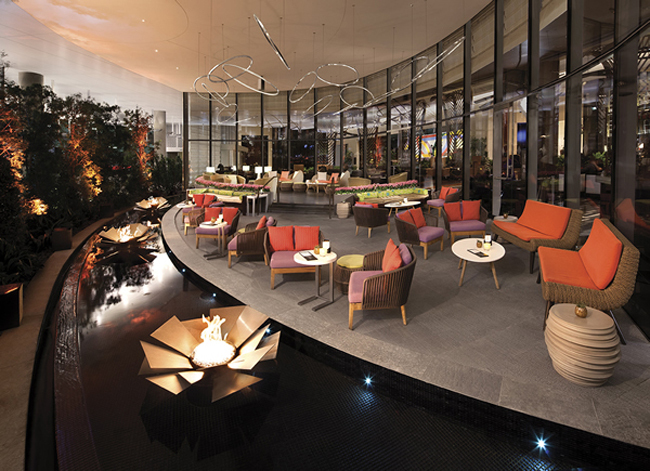 The patio at Vice Versa is separated from the rest of the bar by large glass walls, giving you a connected feeling, while guarded on the opposite side by lush greenery. You can see pedestrians strolling City Center on the other side, but you know they won’t bother you. You can curl up by the fire, rest on the comfortable seating and even enjoy signature cocktails and special small bite selections to make your evening more romantic and complete. It’s everything you love about the outdoors, just without the constant interruptions or annoying performers. Lights, views, seats, a floor, pillows, palm trees, some bird designs, what else could you want? Photo courtesy of Rhumbar. 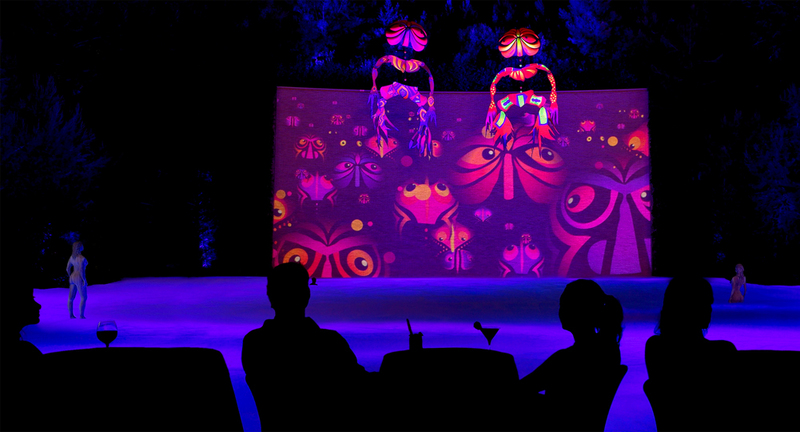 In front of the Mirage, not actually by the volcano, you’ll find the outdoor space of Rhumbar. Don’t let the interior of the bar confuse you. The modern, is this an alien spacecraft or a bar feel fades away once you step outside and find a luxury patio fit for everyone. The space has bar service and a great view. When sports are on TV, you can enjoy your favorite games out there on their large screens. And they have special events when they’re so inclined. If you want an outdoor space for a party while you’re in town this time of year, Rhumbar is one of your best bets. You can reserve the space or just show up and make the staff super happy by tipping really well. The beautiful show at the Lake of Dreams. We don’t try to be funny here. It’s a beautiful and romantic space for you to enjoy. Photo courtesy of Wynn Las Vegas and Barbara Kraft. So far we’ve mostly hit places with views or at least an open feel. Parasol Down at Wynn has both, but they’re slightly different. 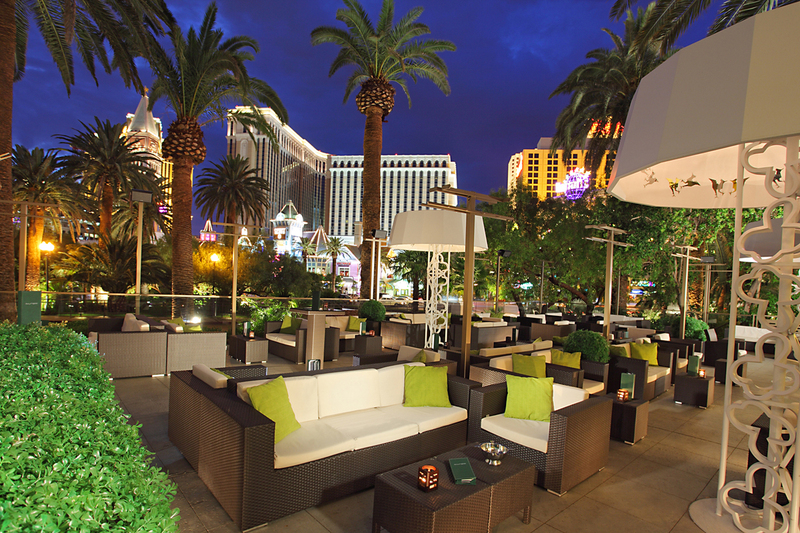 Instead of overlooking the Strip or Downtown, the patio at Parasol Down looks out over Wynn’s Lake of Dreams. You can see a part of the beauty as you stand above the bar looking past the umbrella-like decorations. But once you actually step through the doors you’ll find yourself in a pristine space where dreams come true, if your dreams are exclusively fantastic cocktails and a lake show. Plant yourself on the patio and enjoy the show as the lake comes alive with music, lights and performances. Then toast to a wonderful vacation that you’ll never want to forget as you feel like you’ve found a secret cove all to yourself.